This song was one of the biggest hits of the early 1980s, not just in the Congo (then known as Zaire) but also all over Africa, particularly East Africa. It was composed by Tabu Ley and delivered soulfully by Mbilia Bel who was only 21 years old at the time. 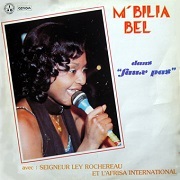 It is one of the songs that put the young Mbilia on the pedestal as Africa’s top female singer. In the song, Mbilia plays the part of a woman admonishing another woman not to try and engage in an illicit affair with her husband. In Lingala, such women as referred to as Mbanda (literally rival) while the concept of sleeping with married men is referred to as Bombanda. This entry was posted in Songs, Tabu Ley& Afrisa Songs and tagged Mbilia Bel, mbilia bel songs, Tabu Ley songs. Bookmark the permalink.